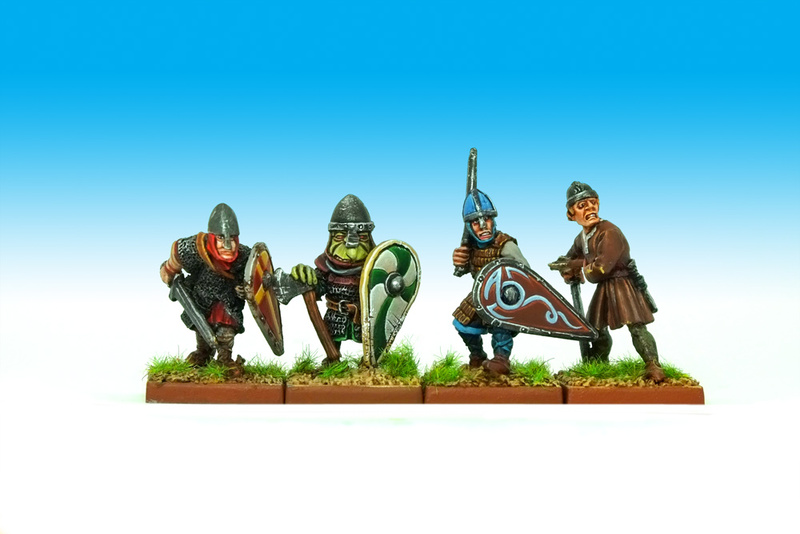 Exploring Citadel Miniatures’ pre-slotta ranges is a real journey of discovery and wonder for me. My knowledge of Games Workshop‘s miniature ranges starts with 1991’s Catalogue 1 – which only goes back as far as 1986 and not right to the beginning of Citadel history (1979) as the name suggests. There’s a great many pre-1986 miniature ranges I have no awareness of, and so I’d never painted any pre-slotta stuff until I found out about this Gnoll. 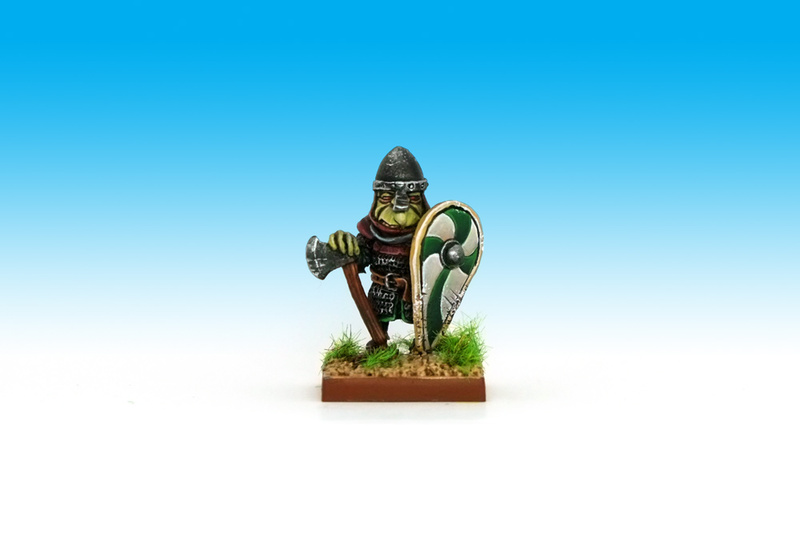 This is no ordinary Gnoll – his nasal helm, kite shield and hafted axe mean he’s Fantasy Tribes FTG14 Gnorman the Gnoll. I picked him while I was trawling the net for 1980s Citadel Normans to reinforce my army. His giant nose and teeny legs do put me in mind of Noggin the Nog. Gnolls in the Warhammer World are described as having ruddy flesh, but I thought that when placed alongside regular Normans he’d work better with green skin to reinforce his inhumanity. As I found out reading Goblin Lee’s blog on Gnolls, the Fantasy Tribes Gnolls were later rebranded as C12 Great Goblins, so I can claim the green flesh is goblin rather than botched Gnoll. Gnollin with more Normans I’ve painted since Salute 2017. I now have fifteen Norman Sergeants, which allows them to rank up pleasingly in a five-by-three regiment. 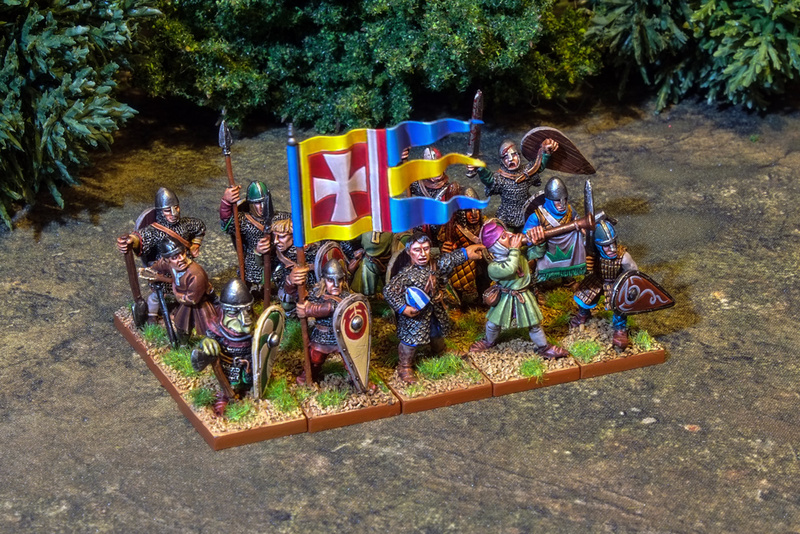 Though these models have been primarily used in Saga where round bases are king, I do like the 20mm square bases to make them into a neat and imposing regiment. 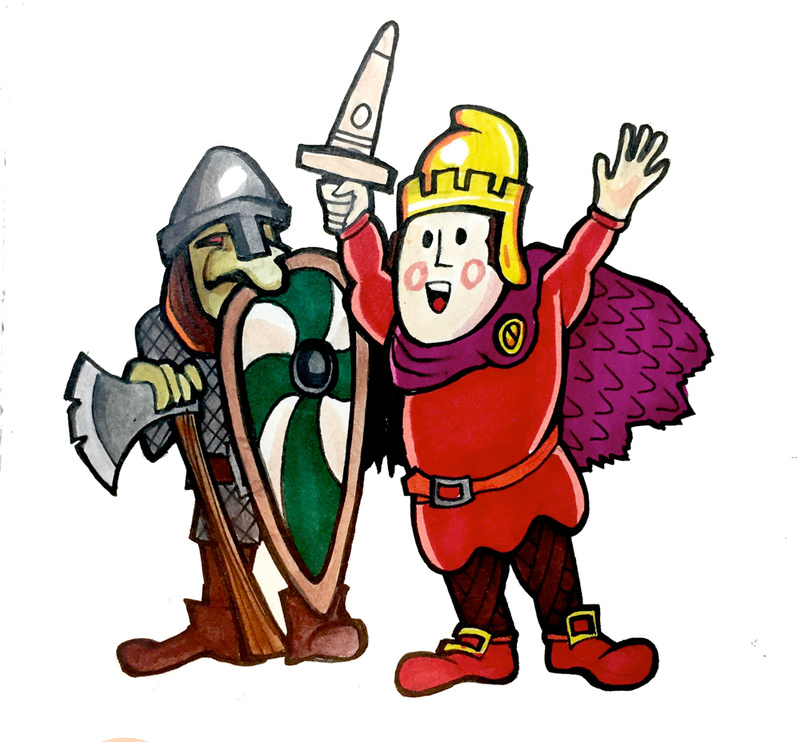 Lord Weuere happy to let Gnollin in his shieldwall. Interestingly, Plastefuchs pointed out that Saga does actually have a fan-made supplement that introduces fantasy races to the game. The Fantastic Saga rules are not done by any of the Saga regulars but a small group from tabletopwelt.de. Depending on what you envision your Gnolls to feel like, maybe the Kobaloi rules could fit well. You can find all of the new rules on http://www.a-fantastic-saga.com/. The sub-forum for AFS is quite active and the developers are there as well, helping out with rules questions. I really enjoy slipping this little piece of fantasy into my historical force; I want to push that envelope further. Watch this space! That’s a mighty job you’ve done on that old fellow. I’m a little at sea myself when it comes to the pre slotta ranges. Thanks! I’d have the ranges committed to memory if Citadel had published lovely big printed catalogue to thumb, full of photographs. Splendid ! I really like how he integrates with the other fellows and kudos for making such a model shine ! When I initially got the figure I was actually a bit disappointed – he was bigger than I thought from photographs (guess that was why he is a GREAT goblin rather than goblin). His beefier-than-anticipated size meant I was uneasy sticking him alongside the humans, but it works! Thanks! I’m sure the people in the rank behind are a bit miffed at having such a diminutive chappy in front of them in the battleline. Lovely work there, its great to see the older ranges getting some love! There’s a little sense of historicity whenever I handle models that are older than me. They feel like genuine antiques. The top class paint job makes the sculpt look more like a boutique, retro Dark Crystal style modern sculpt. Im surprised to see you adding fantasy figs to this force Curis, you being a bit of a purist in many respects. I get round it as the ranges were concurrent, and possibly even sculpted by the same people – Goblin Lee reckoned Gnollin is a Perry or an Ansell (I think it’s an Ansell myself). I can omit him from the force when I am feeling purist, but can stick him in when I’m feeling a bit Warhammer 3E or a bit silly with the historical angle. I do like the idea of fantasy races wandering around England in the Dark Age – accepted as “normal” by the general populace. In the medieval times some people collected what they genuinely thought were griffon eggs. My own knowledge of pre-slotta is pretty limited too. From what I’ve come across, over the years, most of it pretty soft on detail and proportioned terribly. But there are still quite a few gems in amongst the chaff. With you painting style I’m really interested to see what other oldschool stuff you dig up and give the once over to. Now I’ve started to research it I suspect I’ll find the miniatures popping up in all the old books, like the 4th edition Warhammer Fantasy rulebook trio. It’s amazing what’s been hiding in plain sight. When I started collecting the 1985 Citadel Lord of the Rings line I realised those figures appear all over the place. Fanks Crooksy! It’s not an Ansell, further investigation revealed the base was etched with “MP”, meaning it was Michael Perry. And the, er, style of the hand means it can’t be a Bryan Ansell.